MPA BA Competition Chassis (Burnt Bronze) Ships Free! Masterpiece Arms MPA BA Competition Chassis (Burnt Bronze) have taken over the number one spot in the Competitive Shooting arena. Because Phil Cashin and his relentless pursuit for perfection, and the constant evolution of the MPA BA Comp Chassis to make it a true competition friendly chassis. All MPA BA Competition Chassis (Burnt Bronze) are manufactured by Masterpiece arms using their CNC Horizontal Machining Center to exact tolerances from 6061 aluminum. The MPA BA Competition Chassis (Burnt Bronze)comes standard with adjustable length of pull, adjustable cheek riser and adjustment recoil pad. The chassis also includes all the other bells and whistles like:”Ryan Castle” Cut, Bag Rider, Barricade Stop, Spigot Mount, Nightvison Bridge, Bubble Level and EVG Pistol Grip. The BA Comp Chassis will fit up to a MTU Barrel contour while using the Night Vision Bridge. If you remove the nightvision bridge the Chassis will accommodate up to a 1.25 Diameter Straight Barrel profile. The MPA BA Competition Chassis (Burnt Bronze) V-Bedding system is configured to allow glass bedding for the action and also a straight section for the barrel if wanted. The MPA BA Comp Chassis take any AICS type magazine (Not Included). 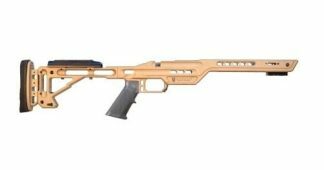 Xtreme Guns and Ammo carries the Masterpiece Arms MPA BA Competition Chassis (Burnt Bronze) in Stock for the Remington 700 Long Action and Short Action Rifle Variants. 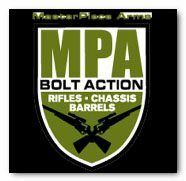 We Stock the MPA BA Comp Chassis in a variety of colors: Tungsten, Gunmetal Grey, FDE, Sniper Green, Black, NRA Blue, Marine Red. Feel free to call us at 832-363-3783 or chat with us online during regular Chat hours. Shop more Masterpiece Arms Chassis Online!